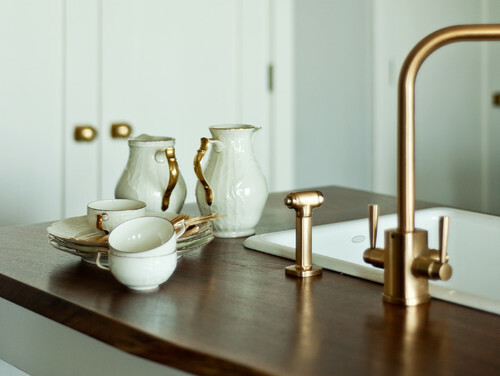 Here is this elegant, modern design using brass fixtures. And even more surprising to me: I really like it. I really, really like it. After years of dominance of brushed stainless steel in modern and contemporary design, here is something totally unexpected and refreshing. It was a difficult pill for me to swallow, because for almost as long as I can remember, brass fixtures have been synonymous with painfully dated design. It will be interesting to see how long and how far this trend will go. Many in the design world have been predicting the decline in popularity of stainless steel appliances in the kitchen. Will brass make it all the way to appliance status? Only time will tell.